Aung San Suu Kyi traveled to the Asian nation of Thailand on Tuesday, her first trip outside of Burma (Myanmar) in twenty-four years, according to the New York Times. 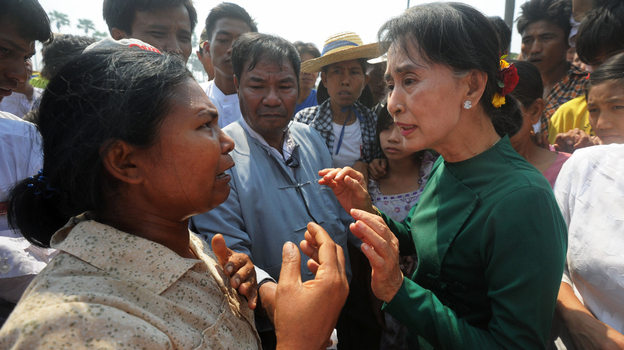 Sherry O’Keefe, author of Champion of Freedom: Aung San Suu Kyi, wrote that “Suu Kyi is widely and affectionately known in Burma.” During her trip, Suu Kyi visited Burmese refugees working in Thailand. Please believe that as our country’s situation gets better and develops more, our value as workers will increase, and people’s perspectives on us will also change for the better. I would like to let you know that you are not forgotten….May you prosper with health, wealth and be free from danger. And may you be able to come home soon. “In late 2010, Burma’s leading pro-democracy leader, Aung San Suu Kyi, walked free after… years of house arrest imposed by Burma’s military rulers,” wrote Sherry O’Keefe, author of Champion of Freedom: Aung San Suu Kyi. Since Suu Kyi’s release, Burma has undergone some major changes, most notably progress toward a democratic government. Yesterday, a historic by-election was held in Burma, also known as Myanmar, for 45 vacant seats in parliament. The National League for Democracy, Suu Kyi’s party, will hold 6 percent of the seats in parliament, according to CBC.